Today’s meeting with the Scottish treble-winners gave Martin O’Neill the chance to look at some of his untested players. Graham Burke (left) comes on for Shaun Williams. IT WAS A day all about celebration for those associated with Celtic Football Club, and Ireland’s makeshift squad just happened to be guests invited along to the festivities. At 32, Scott Brown has won it all domestically in the 11 years since joining the Glasgow giants from Hibernian. The Hoops decided to pay tribute to their beloved captain ‘Broony’ just one day after the Scottish Cup final — meaning the party marking their second consecutive treble was still in full flow — and the FAI agreed to supply the opposition. Given the close ties between the club and this nation, it came as no surprise that many of the Irish players were brimming with pride to line out at the famously atmospheric ground, and avid Celtic fan James McClean appeared particularly determined to impress — possibly hoping to catch the eye of Brendan Rodgers after West Brom’s relegation from the Premier League. However, while the close-to-capacity attendance was treated to four goals, in terms of a competitive spectacle, the game as a whole lacked tempo. And although he was a welcome addition, the presence of 46-year-old Henrik Larsson (along with Blackburn Rovers defender Charlie Mulgrew) on the home team, gave it the feel of a charity or legends match. 2. When is a debut not a debut? Having named an extended 40-man list for the summer fixtures with Celtic, France and the US, Martin O’Neill opted to bring a largely untested group with a sprinkling of experience, as many regulars were given the time off to take holidays. By the final whistle, seven players (three from the start and four more off the bench) had made their first appearances for the Republic of Ireland at senior level. It will no doubt be an unforgettable moment for each of them, but they won’t technically count as international caps as the friendly wasn’t deemed an official match. That said, this provided a huge opportunity for the newcomers to give O’Neill something to extra to think about when planning for the France and the US. It’s difficult to judge players’ performances in games of this nature that are short on intensity, but starters Derrick Williams, Darragh Lenihan and Shaun Williams didn’t do their chances of future involvement much harm. For the likes of 31-year-old Williams and Sheffield United full-back Enda Stevens (27), who got the final 18 minutes, the journey to international football has been longer than most. Matt Doherty and Greg Cunningham have had to be patient to play under O’Neill too. 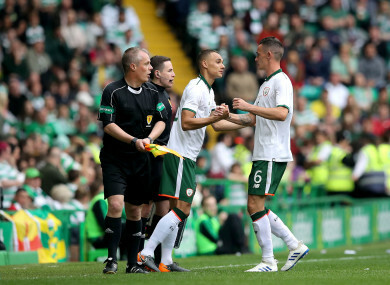 There was a welcome sight just after the hour mark as Shamrock Rovers forward Graham Burke came on along with ex-St Patrick’s Athletic goalkeeper Conor O’Malley and Preston’s Callum Robinson, who recently switched allegiance from England to Ireland. The aim now for all the above mentioned will be to build on this experience and secure bonafide Ireland debuts over the coming months. Those involved today will be given a few days off before the full squad meets up later this week in Dublin. They are scheduled to train at FAI headquarters and then depart for Paris next weekend ahead of Monday’s meeting with Les Bleus. It might be an end-of-season friendly for Ireland, but Didier Deschamps’ men are a matter of weeks away from the World Cup finals — a tournament they are among the favourites to win. A quick glance at the French squad (and the list of players that haven’t even made the final 23) will give you an idea of the embarrassment of riches at their disposal, and it’s only two years since Ireland witnessed first-hand the damage Antoine Griezmann can do during the Euro 2016 last 16. That game Stade de France and the visit of the US to the Aviva Stadium on Saturday, 2 June, should give the Ireland boss a better indication of which players he will be able to rely on when the new Nations League and the Euro 2020 qualifiers come around. Email “When is a debut not a debut? Talking points from Ireland's friendly with Celtic ”. Feedback on “When is a debut not a debut? Talking points from Ireland's friendly with Celtic ”.